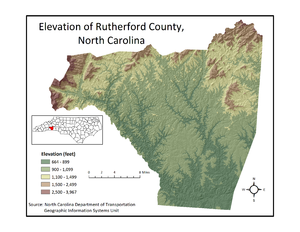 Rutherford County is a county located in the southwestern area of the U.S. state of North Carolina. As of the 2010 census, the population was 67,810. Its county seat is Rutherfordton. Rutherford County comprises the Forest City, NC Micropolitan Statistical Area. In 1791 parts of Rutherford County and Burke County were combined to form Buncombe County. In 1841 parts of Rutherford and Lincoln counties were combined to form Cleveland County. In 1842 additional parts of Rutherford and Burke counties were combined to form McDowell County. Finally, in 1855 parts of Rutherford and Henderson counties were combined to form Polk County. According to the U.S. Census Bureau, the county has a total area of 566 square miles (1,470 km2), of which 564 square miles (1,460 km2) is land and 1.7 square miles (4.4 km2) (0.3%) is water. As of the census of 2000, there were 62,899 people, 25,191 households, and 17,935 families residing in the county. The population density was 112 people per square mile (43/km²). There were 29,535 housing units at an average density of 52 per square mile (20/km²). The racial makeup of the county was 86.79% White, 11.23% Black or African American, 0.20% Native American, 0.22% Asian, 0.03% Pacific Islander, 0.67% from other races, and 0.74% from two or more races. 1.81% of the population were Hispanic or Latino of any race. In the county, the population was spread out with 23.80% under the age of 18, 8.00% from 18 to 24, 27.90% from 25 to 44, 24.30% from 45 to 64, and 16.00% who were 65 years of age or older. The median age was 38 years. For every 100 females there were 93.00 males. For every 100 females age 18 and over, there were 89.60 males. In 2010, Rutherford County was selected as the location for a new $450 million data center for Facebook. Horsehead Corporation announced the construction of its new, state-of-the-art zinc and diversified metals production facility in Rutherford County, NC, near the municipality of Forest City. Rutherford is currently a powerfully Republican county. No Democratic presidential candidate has carried Rutherford County since Jimmy Carter did so in 1976 – and Hillary Clinton's 24.4 percent in 2016 is the worst performance ever by a Democrat. Before 1928 when Herbert Hoover won it, however, the county was a clear-cut part of the Democratic "Solid South". ^ Census, United States Bureau of the (1983). 1980 Census of Population and Housing: Census tracts. U.S. Department of Commerce, Bureau of the Census. This page was last edited on 18 February 2019, at 17:17 (UTC).